Have you noticed more butterflies in Columbia this year? One reason might be Monica Lee and her husband, Noppadol Paothong (Nop). Four years ago Nop and Monica picked up some free milkweed seeds at Powder Valley Nature Center in St. Louis. 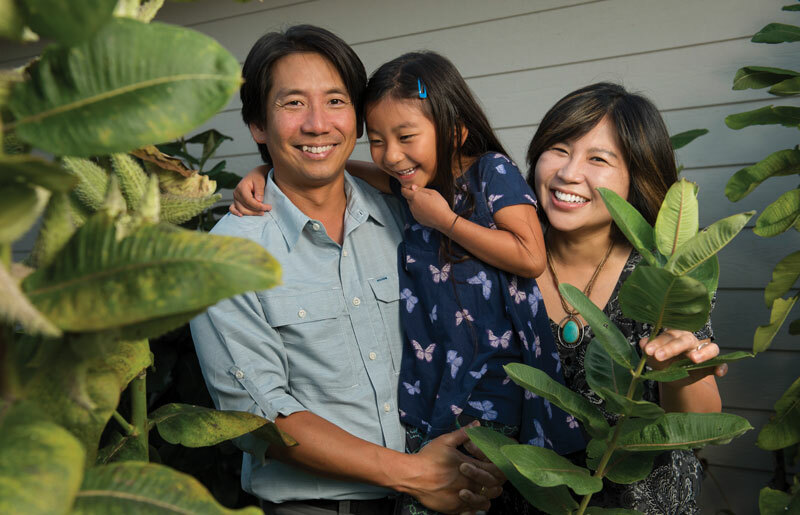 With the help of their then 3-year-old daughter Evalyn, they planted them in their backyard without great expectations for the results. But almost as soon as the spindly plants came up, monarch eggs appeared on the leaves. Evalyn and her parents got close-up views of the life cycle of monarch butterflies, all carefully documented by Nop, wildlife photographer for the Missouri Department of Conservation (MDC). Last year Nop and Monica worked with MDC, the Missouri Prairie Foundation and Russell Elementary School to create an outdoor classroom that would attract butterflies and other pollinators. Together they planted more than 200 native plants. Nop also gives presentations at area schools to spread the buzz about pollinators. Nop grew up in an urban area of Thailand, but his grandmother lived in the country and he spent many happy visits immersed in the natural wonders of the lush, beautiful countryside. He fished, watched birds, studied insect life and grew passionate about his discoveries. “Some people thought I was crazy. I could spend hours trying to catch a fish this big,” he said, measuring about three inches with his fingers. He and Monica, a native of South Korea, met at North Idaho College in Coeur d’Alene in an English-intensive class in 1994. “Monica did much better than me,” he conceded. The couple married in 2003 and Nop landed a job as photographer for the Joplin Globe and later for the Springfield News-Leader. In the course of photographing ribbon cuttings and city council meetings, Nop also got exposed to the prairies of southwest Missouri and all their residents. He discovered the bizarre and beautiful mating dance of the prairie chicken. His photographs came to the attention of the Conservation Department and 12 years later led to his first book, “Save the Last Dance, a Story of North American Grassland Grouse,” published in 2012.